A funny thing happened at Estadio Helidoro Rodriguez Lopez on Sunday. The home of CD Tenerife sits among the picturesque, rocky mountains of the Canary Islands but this weekend, idyllic turned into antagonistic as Francisco Jiménez Tejada popped the Segunda Liga club’s promotion bubble with a smart winner for visiting club Cordoba. You might know Tejada better as Xisco, the man that – ultimately – brought down Kevin Keegan and started the cycle of distrust that still whirs at St James’ Park to this day. 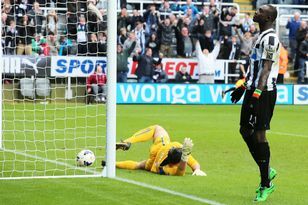 As Xisco scored, and the home fans started waving the white hankies at the former Newcastle man, Ayoze Perez toiled in the evening sun. The 20-year-old has been a revelation this season but his form has tailed off a bit and as his goals have evaporated, so have Tenerife’s hopes of jumping into La Liga. Newcastle had people watching this weekend. Perez could be the future, Xisco is the past – but United are still troubled by the question marks that surround their approach to developing young players. Xisco was a £7million acquisition sold to Keegan as part of a wider plot to encourage South American and Iberian agents to start looking on the club favourably. Newcastle don’t do that anymore, preferring to press the flesh and sell the club a mite more organically these days. It is a healthier approach that builds trust and explains why major agents still take their calls, despite the toxic cloud that has settled over St James’ Park over the last 12 months. What they don’t have – and no amount of top notch scouting and networking can alter this – is a track record of improving the young players that they buy. Perez, described by those with knowledge of him as a “down-to-earth kid with plenty to learn”, might take note. The idea behind signing Perez for just under £2million would be to buy potential. There are those within the club who wonder whether he would adapt successfully to English football because he is not as strong as your typical British 20-year-old footballer. Newcastle’s plan would be to have him drift between the first team and what is termed ‘the development squad’ but that has been a dead end for too many footballers recently. Good money has been spent on Gael Bigirimana and Romain Amalfitano but their progress has reversed drastically recently. Both are available this summer after Newcastle concluded that they would not get the first team football that they clearly need. What of Mehdi Abeid too? The midfielder was praised for his impact initially but fell away badly last season, to the point where he could not even make the squad for the cup competitions that the club treat so lightly. This year he was loaned out to Panathinaikos where his form improved and he became one of the stars of their season. Now the Greek league, Coventry City and the lower reaches of French football do not ask the same searching questions of a footballer that playing in the Premier League for a club like Newcastle do. But each and every one of the players recruited by Newcastle as works in progress have enough ability to at least threaten the first team. There are others who have slipped through the cracks: James Tavenier, Haris Vuckic and Shane Ferguson have all spent time out on loan this season. All are available despite Newcastle’s desperate need to bolster their squad next season. Inevitably, questions will be asked of Pardew’s role in their development. A manager who is actively seeking to recruit Jonjo Shelvey – a typically British powerhouse midfielder – and has previously looked at Darren Bent might not be the best coach to bring on players who come with experience of European leagues. Pardew survived the briefest of summer inquests at Newcastle – his meeting with Mike Ashley was short and to-the-point, with assurances having already been given to him weeks earlier – and that would appear to be wrong. The manager should have been pinned on this and required to re-write a blueprint for developing players from promising fringe men into bona fide first team contenders. His response when asked about Southampton earlier this season was insufficient. To suggest education or economic reasons for the Saints’ impressive youth development was wrong: it is actually more to do with Southampton’s investment in that side of the club. Newcastle, by contrast, only achieved Category One status for their Academy in the last couple of months. It is an area that they have neglected. There have been suggestions of a reshuffle in the coaching staff and perhaps there does need to be movement. The responsibility of ensuring there is a route into the first team for these players would have been a perfect one for a potential director of football, although that idea has been trashed along with the last vestiges of Joe Kinnear’s reputation. United’s young players are an age-old problem. Adam Campbell’s regression is a major source of frustration and is a warning for their England under-19 starlet Adam Armstrong, who is a fine player with substantial potential but is still very, very raw. He will need to be carefully handled if he is not to go the way of previous rising stars Campbell, Nile Ranger and company. Never mind signing young players, Newcastle’s real challenge is to come up with a way of turning soaring potential into points, pedigree and prizes. Simply throwing money at the problem – as they might do if they nick Perez from Tenerife – is not going to cut it.